My Life as a Dog: Bag of Crap? Indeed! 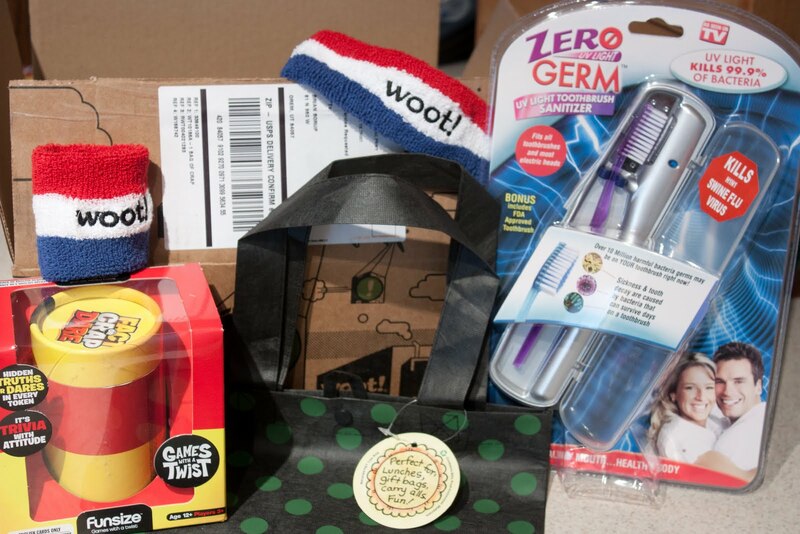 This week I was excited to see that my Bag of Crap from Woot had finally arrived. I picked the bag up and it was fairly lightweight. So I thought it was really crap or maybe one of the legendary letters informing me of a much larger prize soon to come. I suspected it would be the first rather than the latter. An "As Seen on TV" UV Light Toothbrush Sanitizer. The best part is that it "kills H1N1 swine flu virus." That is one of my top concerns when brushing my teeth. A game called Fact or Crap Dare. It says its a "funsize" game. If its anything like a fun size Snickers, it's less fun than a full sized game. And last but not least is the Recycled Tote Bag. It's "Perfect for: Lunches, gift bags, carry alls, Fun!" We'll see how fun it really is.